You Never Know What They Know Until You Push Their Thinking…. Last Friday, at a state math meeting, we had so much fun diving deep into a fraction lesson of a 6th grade teacher. 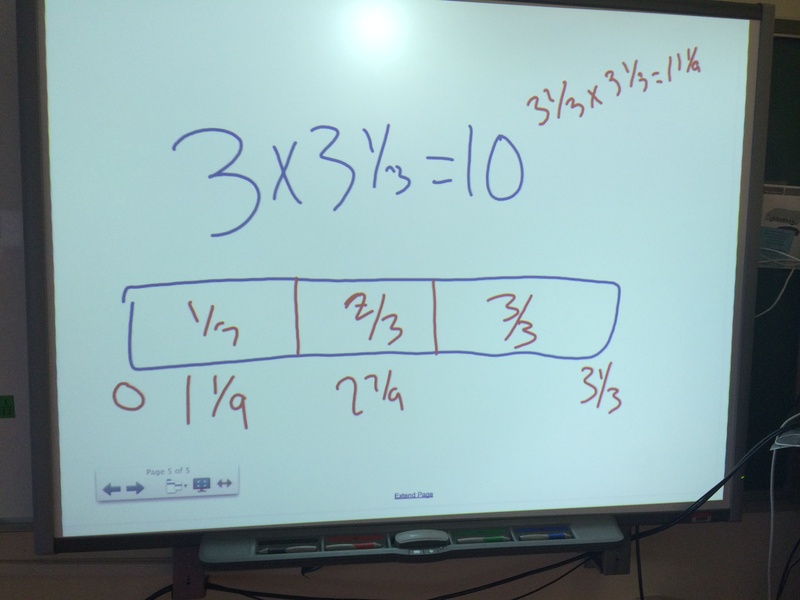 The lesson was on multiplying fractions by fractions and while the conversation started with thoughts about the lesson itself and areas for discussion for the math coach, the lesson really brought to light the fraction progression. I cannot even begin to recap all of the insightful discussion points such as using models and the importance of the representation in mathematics, teacher pedagogy and mathematical understanding, vertical articulation across grade levels….I could go on and on, but I had one brief conversation that leaked its way into my classroom the following Monday. While we were “doing the math” the students would be doing in the lesson video, a colleague and I were talking about where our 5th graders leave off with fractions and how that is built upon in 6th grade. 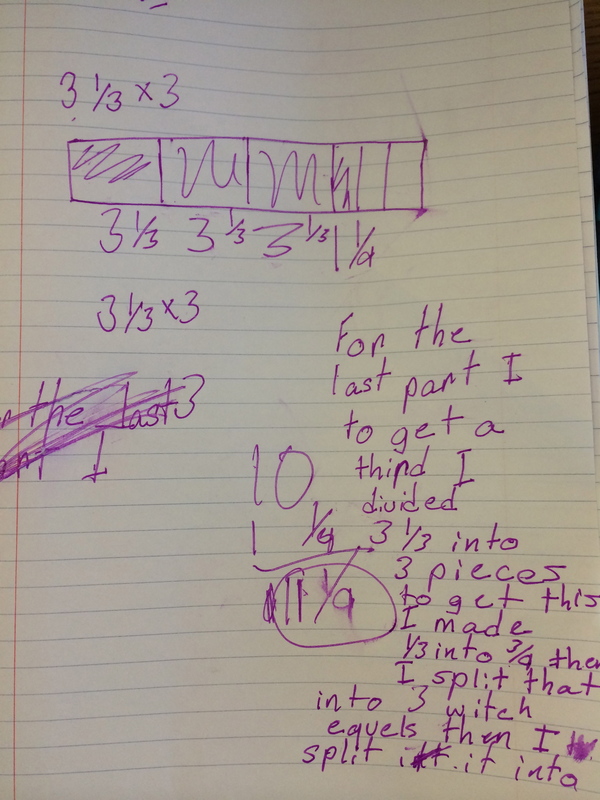 She made the comment that if the students truly understood taking a fraction of another fraction and fraction of a whole number (both 5th grade standards), then they could reason their way through mixed number times mixed number, which is introduced in 6th grade. She quickly drew out 3 1/3 x 3 1/3 and we talked through the context in which our book uses and how students could reason about that problem. So, of course, I have to throw it out to my students on Monday because I am curious at this point if they could work their way through the problem and the various ways they would think about it. This is where that “engaging” vs “not engaging” or “real world” vs “not real world” conversation seems void. I used no context, no real world example, I simply said, “I was talking to some middle and high school teachers at my meeting on Friday about your fraction work and they were wondering how you guys would solve this problem. 3 1/3 x 3 1/3.” They went to work and I started walking around to chat with them. She started with 3 1/3 x 3 and then added another 3 1/3 and found 1/3 of that to be 1 1/9. He used partial products. 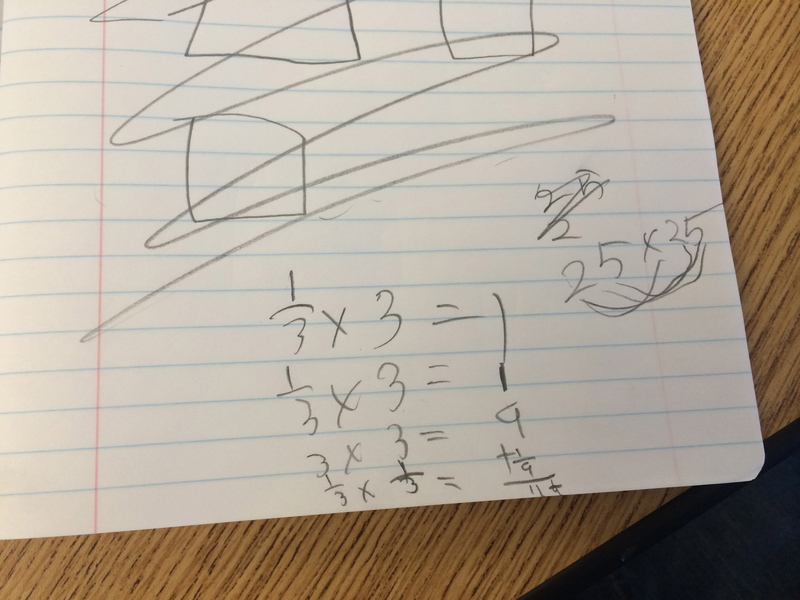 When I asked him how he figured that out, he wrote the 25 x 25 and explained how he gets his partial products there so he did the same thing with wholes an fractions. Wow. Did not expect this one! Same partial products, just a bit neater! 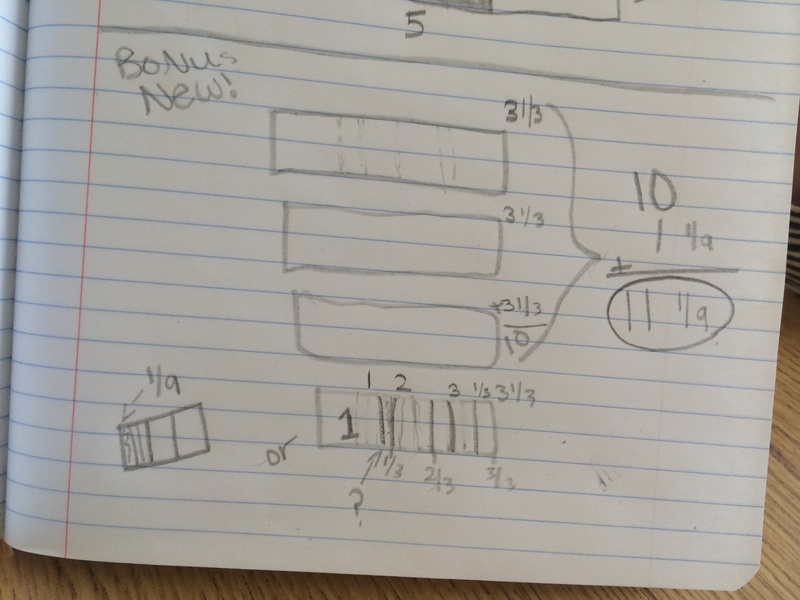 She used separate bars for each 3 1/3 and then divided the bottom up to find the 1/3 of 3 1/3. I was so impressed by the work of these kiddos and they were so proud of themselves! They connected understandings of whole number operations to fractions, applied properties of mathematics, used what they knew conceptually about fractions to model the situation, and most importantly persevered through the problem and constructed arguments about their answer. Don’t get me wrong, it wasn’t all picture perfect….I did have some who initially gave me 9 1/9 (as I anticipated they multiplied the whole numbers then the fractions and put them together) but that led to a great “reasonableness” conversation. A context in this case helped some students see that if you did 3 laps that were 3 1/3 miles long it was 10 miles, so if you did a 1/3 longer, can your answer be less than 10? Needless to say, I don’t know how anyone doesn’t just love hearing students talk about math and reason about problems. I find it energizes me, my students, and the climate in my classroom. So, thank you to MSERC (University of Delaware Math & Science Education Center) and the Delaware Math Coalition for all of the hard work that is put into making these professional development opportunities so rewarding for both myself and my students! I think you all are AMAZING! 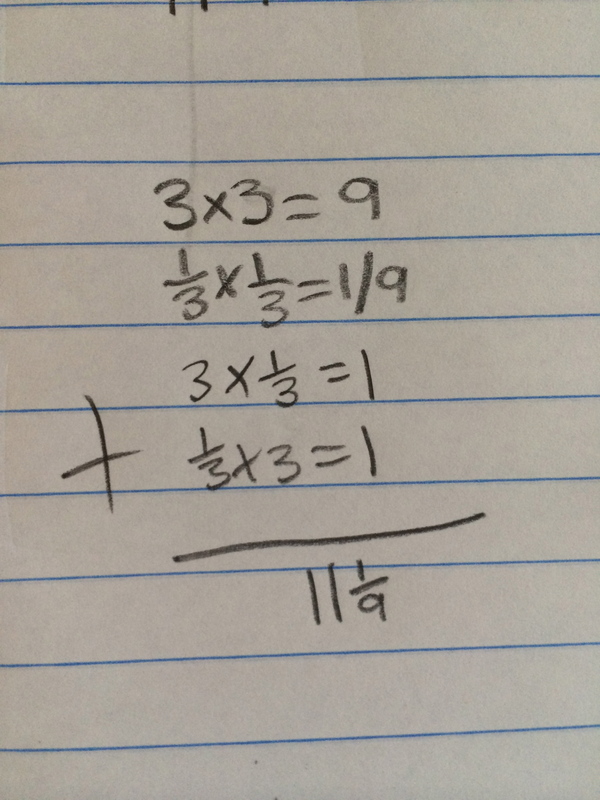 This entry was posted in Fractions, Math, Uncategorized and tagged 5th Grade, fraction bar, Fraction Multiplication, Fractions, Math, Mixed Number on December 10, 2013 by mathmindsblog.